Congratulations to our friends at SEW Eurodrive! They are the winners of the 2018 Chamber Challenge trophy. For years, they have been faithful supporters of the Summer Lunch Buddies program and we are excited to see them take home the trophy this year. See you next year, friends! 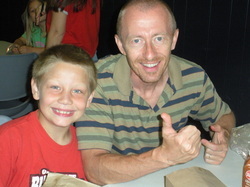 ﻿Summer Lunch Buddies is a program that pairs students entering grades K-5 with teen and adult volunteers. Students eat lunch with a buddy, participate in a group activity and then read for 20 minutes with a mentor. This program was started in 2002 and has successfully continued because of the support of the community and the grant funding from the Paul G. Duke Foundation and The Troy Foundation. In addition to financial support, many local businesses send volunteers to participate in this program year after year. UTC Aerospace, SEW Eurodrive, and Dungan and LeFevre, and Troy City Schools are just a few of the faithful sponsors that continuously provide volunteer support for Summer Lunch Buddies. We are grateful for the many people that make up the "village"!